The Résidence Paris is a private mansion, formerly owned by a famous French singer, redesigned and renovated by its owner to make it a unique pied-à-terre in Paris. The Residence receives only one client at a time. Or one group. You will never cross someone you do not know. This way, our guests benefit fully from each installation, with the assurance of being safe from prying eyes in peace and security. Swimming pool, spa, fitness room, library, are accessible at all hours, including a professional kitchen for those who are hungry at any hour of the night! The staff have their own living room on site to offer you discreet but efficient service throughout your stay. Attentive to Mother Nature, La Résidence Paris is heated by a geothermal heat pump to limit it's footprint on the environment. You have at your disposal the wine cellar and the cigar cellar of the Residence. Like in a big palace restaurant, but three times cheaper! Our policy is to allow you to enjoy whatever is at your disposal, if and only if you feel like it. Want a Chef for a lunch? You will only be charged for its performance, no more. Do you prefer to cook yourself as a family? The staff will disappear and will not return until the end of the meal to clear everything. The Résidence Paris is located in Neuilly-Sur-Seine, the smallest and richest city in France, literally in the West of Paris (see map below). Ideally located between the business district of La Défense and the Champs Elysées, the Résidence Paris is the ideal starting point to start your days of business or tourism with your family. 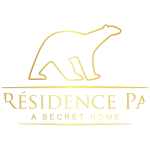 In order to keep the place secret, the address will be given to you as soon as we have the confirmation of your reservation. You will have as neighbors some of the richest families of France. As for children, the Résidence is a 5 minutes’ walk from the Jardin d’Acclimation. A nice garden where all the Parisians like to take a stroll. From sightseeing to shopping, we have selected for you a list of activities to do in Paris. Located in the heart of the parisian west side, we are ideally located next to your hospital for your daily health check.